I first became interested in robots while attending a communications trade show in Kansas City, Missouri, last year. I was not so much taken in by the technology required to make it work at the time, as I am exposed to that daily in my work, as I was the effect it had on the people that were confronted with a robot for the first time. How does one feel talking to a piece of tin and electronic gadgetry resembling something less than a mechanical man, say, a shop type vacuum cleaner? Well, it soon became apparent to me that there are as many types of reactions as there are people. However, three main reaction categories can be derived by observation. The first and most prevalent is surprise followed by bewilderment and in some cases fear. Watching and noting these reactions with Robbie the robot, who weighed some 50 pounds and stood over 5 feet tall, caused the uneasy feeling that if it dropped a wheel off the edge of a walkway, it would topple over, crushing a small dog, child or Volkswagen. This led to the development of Gronk, the second robot, smaller and less threatening. 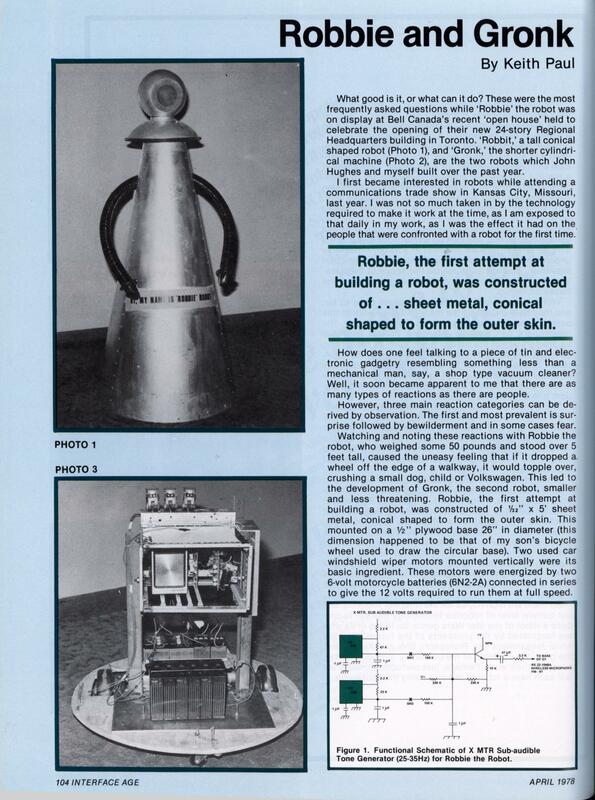 Robbie, the first attempt at building a robot, was constructed of 1/32″ x 5′ sheet metal, conical shaped to form the outer skin. This mounted on a 1/2″ plywood base 26″ in diameter (this dimension happened to be that of my son’s bicycle wheel used to draw the circular base). Two used car windshield wiper motors mounted vertically were its basic ingredient. These motors were energized by two 6-volt motorcycle batteries (6N2-2A) connected in series to give the 12 volts required to run them at full speed. Two speeds were provided by using the full 12 volts or tapping into the 6 volt connection, approximately 60/30 rpm respectively. Fast or slow speed was selected by a manual switch placed just below the back of his head at shoulder level, along with the power on/off switches. The forward, right and left turn functions were accomplished by simply providing power to both, left or right wheels respectively. This was all under remote control using a hand-held RS, FM-91 Wireless Microphone and an RS AM/FM Pocket Portable Radio 12-609 mounted in the head of the robot. The head is a sphere, originally used as a speaker enclosure. With the speaker removed and the receiver taking its place, along with the antenna sticking out the top of it, I now had remote controlled voice and functions. The functions were operated by transmitting sub-audible tones 25 and 35 Hz which were push button energized and injected into the FM transmitter’s amplifier stage (Figure 1). At the receive end the sub-audible tones were picked off the receiver speaker (using the earphone jack, modified) and cabled to the base where they were amplified and used to lock two phase lock loops (567’s). If and when they lock, it causes an output which controls a transistor driver which in turn operates two RS 12V DC DPDT relays. The 6 or 12 volts derived from the motorcycle batteries were passed over the form ‘c’ contacts fo the relays to the windings of the motors (Figure 2). 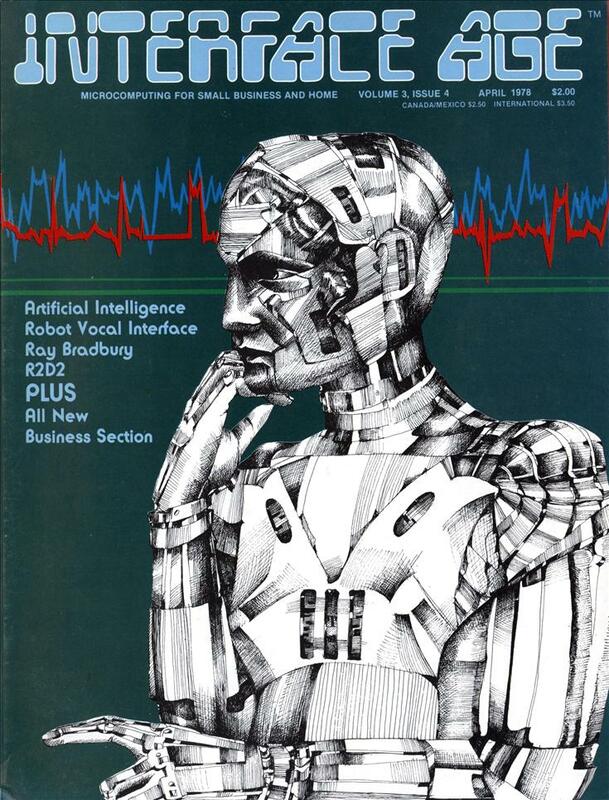 By pushing the buttons on the control box which injected the sub-audibles into the FM transmitter and/or speaking into the associated microphone you could control the forward direction of the robot and provide a voice. Clearance lights, inserted in to the 2″ exhaust flex tubing used for arms, which were subsequently bound with plastic electrical tape, were lighted over contacts of the right/left relays when the motors were energized. This provided some measure of awareness. It was soon found that the FM transistor and receiver would fade and/or drift off frequency just enough to give unreliable operation. Also, the phase lock loops wouldn’t, at times most of the electronic buffs know. Worse than that, it is characteristic for their output to become pseudo analog. This means that the output fluctuates rapidly between zero and one, leaving you in the “twilight zone.” When this happens Robbie’s behavior becomes erratic to say the least, and just maybe you have created a monster. However, this first attempt was worthwhile as I soon found out what approach not to take. I should add, however, that for some fun with a semi-autonomous, (not designed that way), robot at a price almost anyone can afford, this approach has merit. My second attempt at being creative resulted in a robot known as Gronk. Physically short and squatty, about 40″ high and 22″ in diameter, is more robotish in the popular sense. Photo 2 is a general view of this robot as it appears. Practically speaking it resembles a large domed can of spray deodorant. Actually the outer skin is a 40 gallon (Imperial) hot water tank cover chopped down to 26″. The machine is cylindrical, and weighs 50-60 pounds. The metal skin is covered with felt material, which gives it a warmer appearance plus color. This skin is removable for gaining access to the drive motors and electronic controls. Limited access to these components is also available through a covered port at the back. Modular construction is used where possible, i.e. motor mounts, plug-in relays and circuit cards, etc. (Photo 3). The entire unit is powered by a number of 6 volt motorcycle batteries connected in series to provide up to 24 volts DC. The robot’s locomotion comes from two drive wheels (Photo 4). An idler is provided as a third wheel for balance. Direction is given by stopping one wheel and driving the other. The wheels are constructed of solid rubber 41/2″ in diameter and 1Vz” wide with a center steel core that has been forced onto a steel shaft. The shaft is geared and mounted between two self aligning pillow blocks. If both wheels are moved in the same direction, the robot travels forwards or backwards in a straight line. If the wheels are moved in opposite directions, the robot executes a near perfect rotation about its vertical axis. The precision of movement is limited principally by non-planer floors, wheel slippage, unequal wheel diameters, and the like. The drive motors are Delco Appliance Motors #5070200, 12 volt DC reversable clutch driven geared units with electro-mechanical braking. I found these at an aircraft surplus parts store in Toronto. By the way these surplus stores, rather than the usual electronic surplus stores, have a better selection of good quality components at an almost affordable price. These motors were only eight dollars a piece; the wiper motors previously used were ten dollars each. I found matching shaft gears that gave me a wheel rotation of approximately 60 rpm. These were then assembled on a steel plate 1/4″ x 15″ x 13″ to form the arrangement as shown. Incidentally, don’t use steel. Use aluminum and bolt things together if you don’t have access to a heliarc welder. This cuts the weight down significantly (5-10 lbs.). These motors are driven by 12V DC through contacts of RS 12V DC DPDT relays. I used these relays as they are “plug in” and have the contact current carrying capacity and operate voltage values that are required. This time, audible coded voice frequency tones were used at the transmit end, modulating a voltage controlled oscillator which provided a 16 kHz subcarrier center frequency. This subcarrier modulates a 100 mw crystal controlled transceiver which is currently in popular use, (Figure 3). A transceiver of a similar type is used to receive these coded voice frequency tones, which are put through a high pass filter and limiter. This 16 kHz subcarrier modulated by the coded voice frequency tones is demodulated using a 567 phase lock loop configured as an FM demodulator, leaving the VF tones only. Seven tones matrixed to provide 19 combinations give more than enough discrete outputs to drive the features that I wanted to include. All this is housed on a vertical stand welded to the metal base, (Figure 4). They would do well as extras in MST3K.